Isolated torsion of the fallopian tube is a rare condition occurring primarily in the reproductive age group in which patients present with lower abdominal pain. Herein, we report a case of isolated fallopian tube torsion in a post menopausal woman which was misdiagnosed on Ultrasonsography (USG) as multilocular ovarian cyst. Intra-operative findings confirmed fallopian tube torsion. Isolated torsion of the fallopian tube is a rare entity manifesting as acute abdomen. The incidence is about 1 in 1,500,000 women. Paucity of pathognomonic signs often lead to misdiagnosis. A 55 year old post menopausal lady presented with acute onset lower abdominal pain since last 4 days with no other positive symptoms. On examination pulse rate of 106 beats per minute was noted. Per abdomen mobile mass of 12 to 14 weeks of gravid uterine size was present over the hypogastric region. On bimanual examination uterine size could not be made out, bilateral forniceal fullness was present with tenderness in the right fornix. 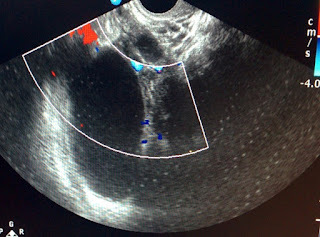 USG showed a well-defined multilocular complex cystic lesion in the right adnexa measuring 13x9x7 cm with few incomplete septae and few low level echoes. Septations appeared thin < 3 mm and showing septal color uptake with a high resistance flow with RI of > 0.8. Right ovary could not be visualized separately. Figure 1. Well encapsulated pyriform cystic lesion with incomplete septae showing color uptake of high impedance. On the left there was well defined multilocular cystic lesion measuring 7x6 cm with no internal and peripheral color uptake. These findings suggested the possibility of bilateral cystadenoma of mucinous variety. Positive whirlpool sign was noted in the right adnexa with a suspicion of torsion. She had leucocytosis on routine hemogram. Liver and renal functions tests were normal. CA-125 levels were in the normal range. Exploratory laparotomy revealed retort shaped gangrenous right hydrosalpinx of 14x9x8 cm with two rotations at the neck with the normal sized ovary on the right side and a left ovarian cyst of 8x7x5 cm. Total abdominal hysterectomy with bilateral salpingo oophorectomy was done. Histopathology confirmed right gangrenous hydrosalpinx. Figure 2. 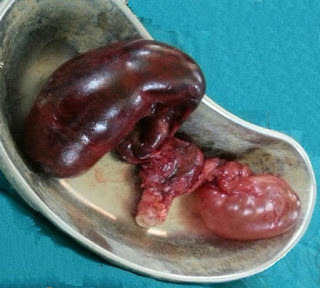 Macroscopic appearance of right gangrenous hydrosalpinx and left ovarian cyst. It is rare before menarche and during menopause because apparently the risk factors occur mainly during the reproductive age group. Right sided torsion is commoner than the left. This is partly due to congestion of the right fallopian tube due to slow venous drainage or hindered mobility of left tube by the sigmoid colon. Ipsilateral radiating pain, that begins at the lower abdomen or pelvis but may refer to the flank or thigh is the most common complaint. Associated symptoms include retching and vomiting. The differential diagnosis includes torsion ovarian cyst, acute appendicial etiology, adnexal pregnancy, pelvic inflammatory disease and degenerating fibroid. Rarely mesenteric panniculitis and epiploic appendagitis can be a cause of right iliac fossa pain. Imaging findings in torsion of fallopian tube are imprecise and not specific and clinical correlation is imperative. USG findings of dilated fallopian tube (hyperechoic wall, incomplete septae, foci of echogenicity protruding into lumen, tapering end towards cornua of the uterus, endosalpingeal folds ) with a normal-appearing ipsilateral ovary are found. Baumgartel et al described the manifestations of high-resistance flow; although very uncommon or absence of flow in a tubular structure as sign of tubal torsion. Whirlpool sign on rocking probe movement is specific. 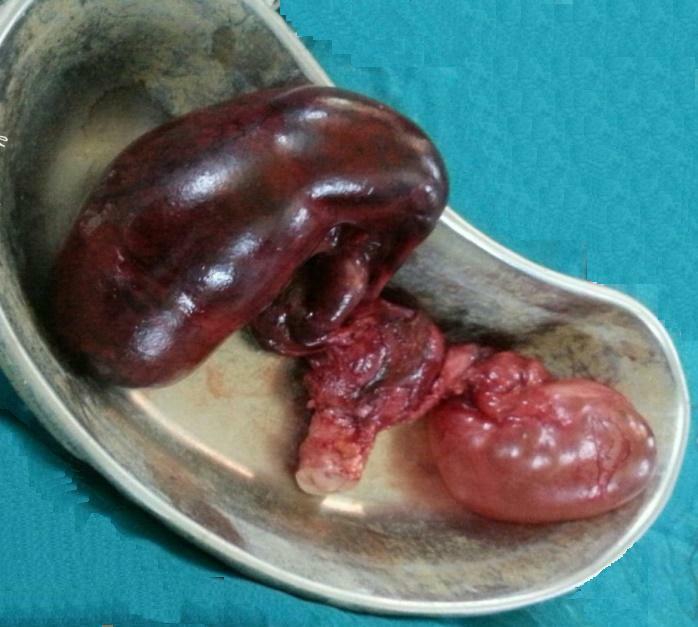 This patient was misdiagnosed as torsion of the right ovarian mucinous cystadenoma as there was an evidence of mucinous cystadenoma on the contralateral side. Laparoscopic adnexal detorsion is the treatment of choice in the child bearing age and complete resection is recommended in patients with completed family, in the settings of associated neoplasms and when the tube has undergone infarction and gangrene. In conclusion although fallopian tube torsion is a rare entity, it should be considered as a differential of acute lower abdominal pain in all women. The paucity of specific imaging findings generally leads to a retrospective diagnosis of this condition. We acknowledge Dr. Priyanka Vora working currently at NWMH for improvement in the manuscript. Baxi SH, Shah SJ, Trivedi YN, Babaria NJ. Torsion of the Fallopian Tube with Hydrosalpinx in a Post Menopausal Woman : A Rare Presentation. Gujarat Medical J 2010; 65(1): 55-56. Laddad MM, Patange RP, Singh N, Gupta N. Rare presentation of large bilateral hydrosalpinx with acute torsion. Journal of evolution of Medical and Dental Sciences 2013; 2(14): 2234-2238. Varghese U, Fajardo A, Gomathinayagam T. Isolated Fallopian Tube Torsion with Pregnancy. A Case Report. Oman Medical J 2009; 24(2): 128-130. Vijayaraghavan SB, Senthil S. Isolated Torsion of the Fallopian Tube: The Sonographic Whirlpool sign. J Ultrasound Med 2009; 28: 657–662. Bakshi R, Mehta A. Isolated Torsion of the Fallopian Tube with Hydrosalpinx – A Rare Presentation. The Internet J of Gynecology and Obstetrics 2008; 10(2): 1-3.